Your new home will require a solid concrete foundation to assure that the structure will stand the test of time. There are several types of concrete foundation systems available depending on where you live and the type of foundation system you will install. Let’s begin with the most basic of structural concrete foundation systems. The structural slab concrete foundation system is common in climates where heaving from in ground winter frost is not a concern. The structural slab system shown in this example is a typical model; you must confirm the correct sizes and steel reinforcement requirements for your soil conditions. The key to success with this concrete foundation system is to insure that you do not pour on top of any added soil. If you must increase the grade or height of the base below the concrete foundation it must be done with compacted crushed rock or compacted sand. These products will not settle causing a void between the sub straight material and the finished concrete. This void would eventually result in a crack in your floor and possible failure of the system. The last part of this system will be to install ½ in. L-anchor bolts into the wet concrete foundation a maximum of 72 in. apart on a single story building and 48 in. apart on a 2 story building. Tip of bolts should be 2-3/4 to 3 in. out of the concrete foundation. Make sure to align these bolts where they will fall in the center of the wall base plate. Also make sure not to install bolts in doorways but do place bolts as required directly next to door openings and 6 in. back from both sides of every corner. In a spread footing concrete foundation system all of the primary load weight is being transferred to the bottom of the footings. 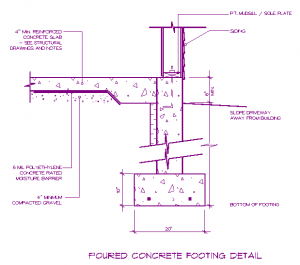 For this reason it is important to confirm the required width and depth of footing required for your project with a local engineering review. Here a structural engineer will determine the soil density at your site. Armed with this information they will be able to recommend the appropriate size footings to support the concrete foundation, floors, walls, and roof system weight that will be bearing down on your footings. Our example shows a rather light duty configuration. In our Midwest market a 18 in. wide by 8 in. deep footing system is more common. 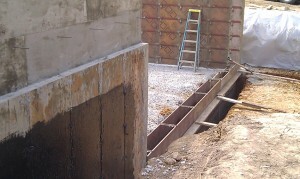 Steel rebar reinforcement is required with this type of concrete foundation. (Confirm code requirements in your market) In our example this market calls for ½ in. steel rebar placed no more than every 18 in. horizontally up the wall beginning in the footing. If the concrete foundation wall is taller than 2 ft. you should also install ½ in. steel rebar vertically no more than 18 in. apart plus at every construction joint. All steel rebar intersections need to be securely tied together with rebar tie wires. The last part of this system will be to install ½ in. L-anchor bolts into the wet concrete foundation a maximum of 72 in. apart on a single story building and 48 in. apart on a 2 story building. Tip of bolts should be 2-3/4 to 3 in. out of the concrete. Make sure to align these bolts where they will fall in the center of the wall base plate. Also make sure not to install bolts in doorways but do place bolts as required directly next to door openings and 6 in. back from both sides of every corner. 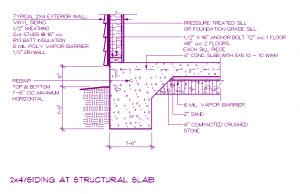 In a spread footing with basement concrete foundation wall system you will follow all of the details listed for the spread footing with foundation wall design. In a spread footing concrete foundation system all of the primary load weight is being transferred to the bottom of the footings. For this reason it is important to confirm the required width and depth of footing required for your project with a local engineering review. A primary difference in a basement concrete foundation wall will be the use of at least an 8 in. thick wall to withstand the horizontal load placed on the wall from the exterior backfill. 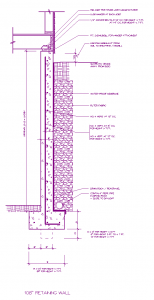 If your wall will include a supporting brick ledge you will probably be using a 10 or 12 in. thick wall with a 4 in. brick ledge. 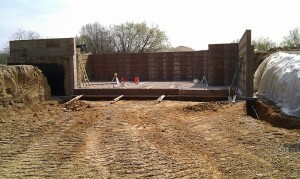 Steel rebar reinforcement is required with this type of foundation. (Confirm code requirements in your market) In our example this market calls for ½ in. steel rebar placed no more than every 18 in. horizontally up the wall beginning in the footing. If the foundation wall is taller than 2 ft. you should also install ½ in. steel rebar vertically no more than 18 in. apart plus at every construction joint. All steel rebar intersections need to be securely tied together with rebar tie wires. The last part of this system will be to install ½ in. L-anchor bolts into the wet concrete a maximum of 72 in. apart on a single story building and 48 in. apart on a 2 story building. Tip of bolts should be 2-3/4 to 3 in. out of the concrete. Make sure to align these bolts where they will fall in the center of the mud sill. Also make sure not to install bolts in doorways but do place bolts as required directly next to door openings and 6 in. back from both sides of every corner.